Nottingham's Julian 'YoYo' Thew has finally captured the EPT title that has been evading him for so long. 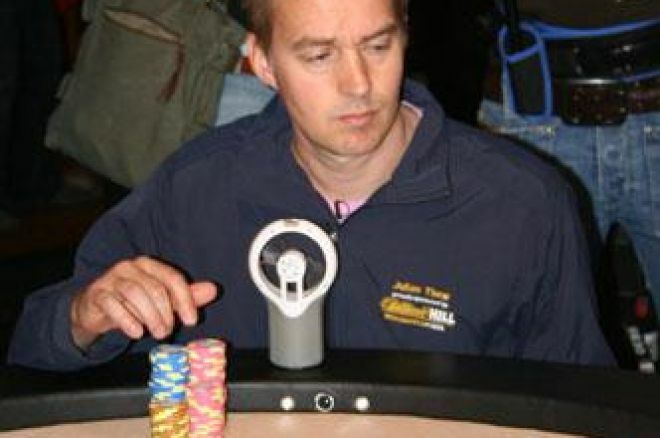 The EPT Baden Classic was his 4th EPT Final Table; he came 9th in London and 7th in Dublin in 2004 and 4th in Copenhagen in 2005. Julian is possibly the most prolific player on the UK Circuit but this title has proven he is a big player on the world stage. It was a shorter field than the previous two EPTs thus far this season with 282 player, but a strong one nonetheless. Patrik Antonius, Barry Greenstein, Dario Minieri and Chad Brown all amongst the international names that made the event. €670,800 and the title was awaiting the winner. The chip lead was shifting between Julian and Vladimir Poleschuk of Russia for most of the early proceedings. Thew took control when he crippled Thomas Fuller of the USA when his pair and flush draw improved to a flush against Fullers set of sixes. Thew then held nearly a 2-1 chip lead and was left to face Denes Kalo of Hungary heads up, after Kalo eliminated a worn down Poleschuk. Despite a significant chip lead over Kalo, it took Thew over an hour to dispatch of the formidable Hungarian. Eventually all the money went in the middle with both men holding ace-rag, with Thew's 8 kicker managing to hold against Kalo's 5. Last month Thew picked up the GUKPT Plymouth title and the poker world breathed a sigh of relief that finally one of the best players in the UK had picked up a major title, after narrowly missing out on so many. With this victory Thew has capped off a brilliant 2007 which has seen him dominate the last few months in every tournament he has played. Thew said after the match: "I pledged to pay off my mortgage before my 40th birthday and only had ten days to go when EPT Baden began. I still can't believe I've won. EPT fields are so big now, with such good players - you think you can do it, but then you also think it's just never going to happen." Not only is this a great victory for the UK, it is a fantastic victory for poker in general. Julian genuinely is one of the nicest and humblest guys you will ever meet at the table, which is an amazing paradox because he is one of the scariest people to play against. This victory was certainly due for Julian and hopefully this might be the start of Julian's attack on the world stage. [I] Sign up to Everest Poker for an exclusive Pokernews bonus.